Microsoft annouced that its public cloud platform Azure will have a new feature called Availability Zones. Availability Zones add a more granular control for the location were virtual machines are running. 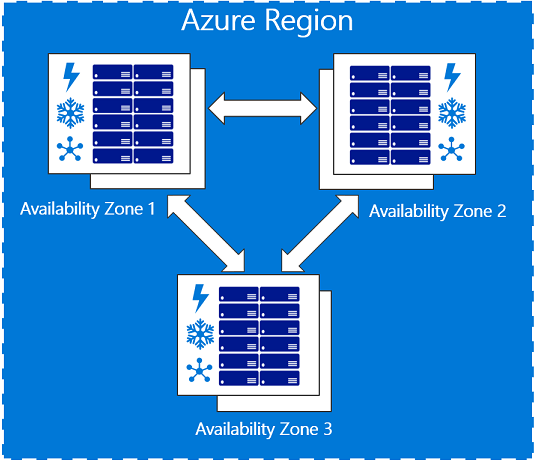 Without Availability Zones, multiple instances of the same application running in the same Azure region could be running in the same datacenter facility. If cooling, network or power in the datacenter goes down, the application will be down as well. To prevent , customers can use the paired region. However that might be further away which has a negative effect on latency. Now in preview , once Availability Zones are general available Microsoft will provide a 99.99% uptime for the virtual machine SLA. Azure has regions which is a group of datacenters (two or more) grouped close to eachother (roughly near a large city like Amsterdam or Dublin. Each region is paired to another region which is far enough to avoid both regions will be affected by natural disasters. Availability zones makes it possible for customers to spread virtual machines over datacenters part of the same region. Each region which has the Availability Zones feature has at least three zones. A zone is a datacenter which has its own cooling, power and networking. The image below explains the availability zones.